15 Minute no cook vegan low FODMAP tomato soup is the perfect quick lunch recipe. 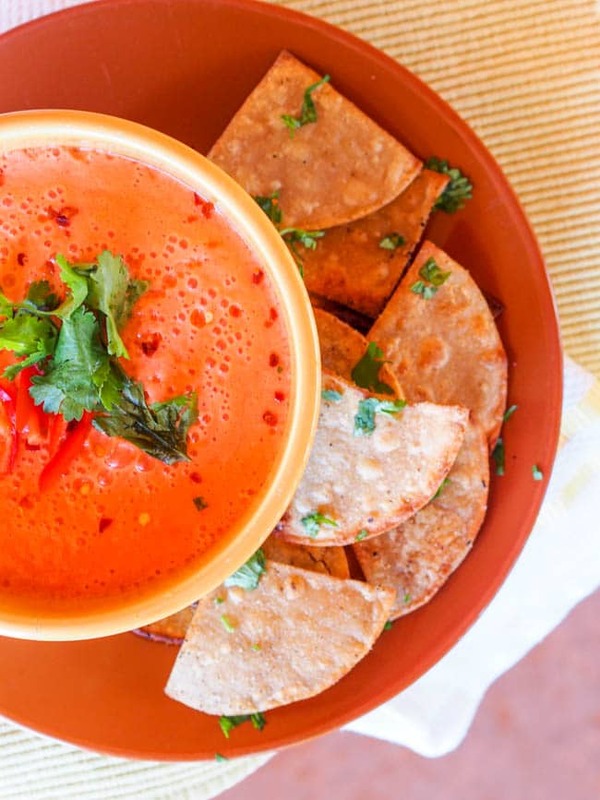 Creamy and fragrant, made with red peppers, tomatoes, tahini, and almond milk this room temperature soup makes for the ultimate feel good meal. Gluten-Free and vegan. Ever heard of a low FODMAP diet? If you haven’t, a low FODMAP diet limits foods high in fructose, lactose, fructans, galactans and polyols. Some of the foods to be avoided include onions, garlic, beans, wheat, legumes, apples, mangoes, grapefruit, etc). Who is this diet specifically good for? Those with IBS. Irritable Bowel Syndrome (IBS) is a serious GI issue that affects the large intestine (colon) and commonly causes cramping, abdominal pain, bloating, gas, diarrhea and constipation; there is no cure or known cause for IBS. I personally have friends and family members who suffer from IBS and I know how serious and uncomfortable this condition is. Over the years I have heard from both friends and family that changes in diet have been the biggest contributors to controlling and managing the IBS symptoms and making sure those conditions improve. A low FODMAP diet seems to be at the center of these changes (About 75% of IBS sufferers get relief from symptoms with a low-FODMAP diet*). I am a true believer in diet changes having a drastic impact on your overall health but specifically in the management of various ailments, symptoms and diseases. I completely support testing out various diets depending on what medical issues you are facing. Though it can be difficult at times to completely overhaul what you have been eating the long term benefits are worth it. In honor of my friends and family members facing IBS I wanted to share an IBS friendly low FODMAP recipe. This no cook vegan low FODMAP tomato soup makes for the perfect lunch. One of the many ingredients you cannot incorporate into cooking on a low FODMAP diet is garlic and onions – the real foundation for many of my meals. But there is no reason to get discouraged. Even without those ingredients you can create delicious recipes made from scratch. In this soup I omitted onions and garlic and made this directly in the blender with tomatoes, tahini, olive oil, sugar, red bell peppers and almond milk. The result was a silky smooth lightly creamy and refreshing bowl of low FODMAP tomato soup. 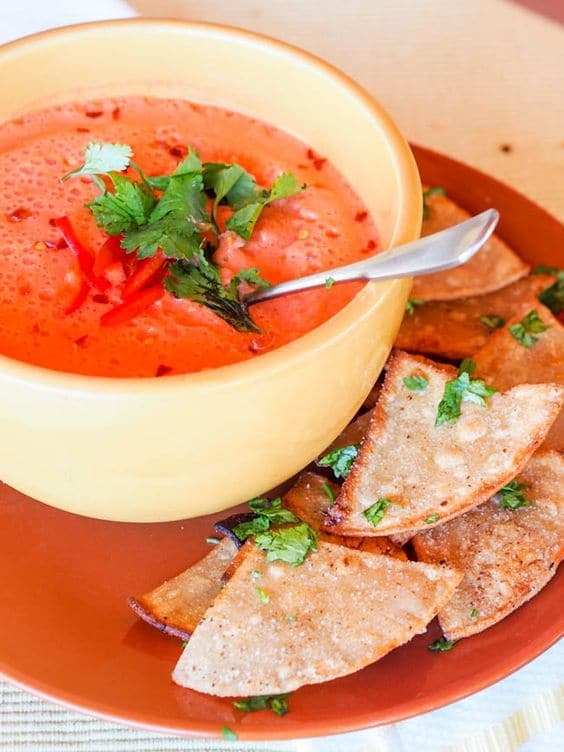 The tahini and red bell pepper adds in a depth of flavor that you wouldn’t have with just tomato soup. You could heat this low FODMAP tomato soup up on the stove top but better yet serve it at room temperature. This instantly brought back memories on sipping on gazpacho while I was traveling abroad in Spain back in 2009. From another friend (this time male) who has IBS I have heard that another large contributor to feeling better for him was finding and taking the right probiotic. That’s where VSL# 3 comes in. 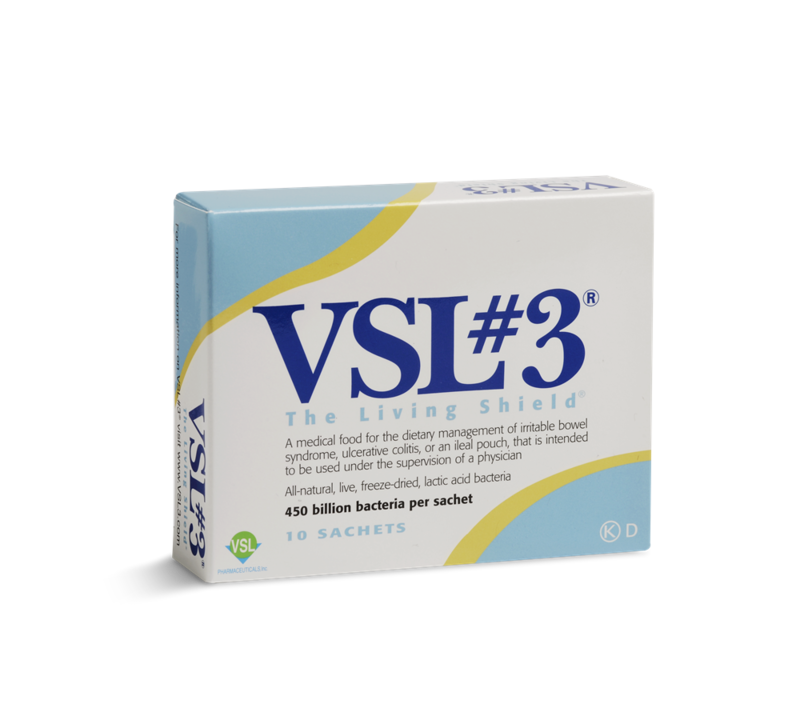 VSL#3 is a high-potency probiotic medical food that is clinically proven in the dietary management of irritable bowel syndrome (IBS), ulcerative colitis (UC) and ileal pouch. VSL#3 products must be refrigerated to maintain potency, are gluten-free, Kosher and Halal certified. VSL#3 can be bought at a local pharmacy, though you will have to ask the pharmacist for it since it is kept in the refrigerator. For more information head over to VSL#3 and use the code “DOCTOR” at checkout for $5 off. 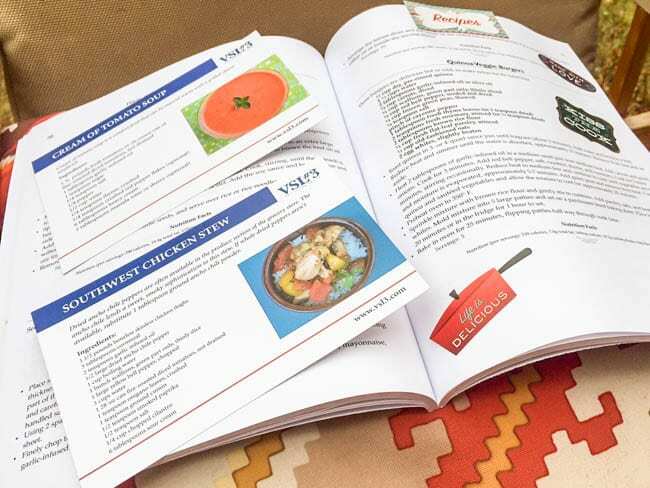 Enter the IBS-Friendly Feast Giveaway today where the Grand Prize winner will receive a cooking class for two at William Sonoma or Sur la Table stores and custom IBS-friendly recipes from VSL#3. Five runners-up winners will receive a one-month supply of the VSL#3 product. Enter before 11/25 at 12 p.m. ET! Furthermore you can find VSL#3 on Facebook for giveaways and exclusive offers, Youtube for a series of videos packed with helpful info about IBS & UC and on their recipe page for IBS friendly recipes. What do you think? 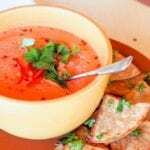 Have you ever tried a low FODMAP tomato soup before? Willing to give it a shot? I know you’ll love it! If you’re looking for other cold soup recipe ideas be sure to check out my Vegan Avocado Gazpacho! 15 Minute no cook low fodmap tomato soup is the perfect quick lunch recipe. Creamy and fragrant this room temperature soup makes for a perfect feel good meal. Gluten-Free, vegan and low FODMAP. In a blender combine tomatoes, tahini, salt, water, olive oil, sugar almond milk, and bell pepper. Serve sprinkled with red pepper flakes and cilantro. *I personally have not tested out the probiotic as I do not have IBS and this not a product review. I love tomato soup! Nice to find an easy vegan option! It’s the best right?! You’re bound to love this one! I like tomato soup but have never tried making it. Good to have a recipe now. This one is sooo easy to make you’ve got to try it! No cooking required, just blend everything together! Thanks! Haha yes happy belly food indeed! This got to be the most summery soup recipe ever…love the use of Tahini here too.. It is seriously perfect for summer — which I what I currently feel like I’m living in here in Costa Rica! I like the idea of adding the tahini. Next time we make a soup with tomatoes and peppers we’ll give it a try. The tahini adds a nice depth of flavor. Highly recommend trying it in your next tomato soup recipe! Oh my gosh where was this beautiful recipe when I was trying to go raw vegan?! This sounds delicious, and although I’m a bit more cooked and a bit less vegan in my diet, I’d love to try this out. I love that you’ve added bell pepper to your soup! What a scrumptious combination! I have a friend who has IBS. The next time I see her, I will give her your website info. I know she goes through a lot of discomfort. I know she would love this recipe! Thanks for passing it along to her. This low FODMAP soup shouldn’t give her any problems! I love easy and delicious and this awesome vegan soup perfectly describes that! A must-try! I love quick fix meals and this looks like a yummy addition to my list. Will try this out too! Hope you enjoy it Nagi! It’s so easy to make I’ve literally made it twice in the last week alone! I never tried a raw tomato soup but I’ll bet it’s delicious! It certainly is! You’ve got to try it! WOW. This looks so yummy. We have always been fans of tomato soup, but we’ve never tried it this way. Sounds awesome – saving for later! If you love tomato soup you’re going to love this super light blenderized version! Your soup looks so refreshing. I’ve been cooking all day so I’m overheated … a bowl of that would be perfect right now. Haha yes this is the perfect cool down meal! 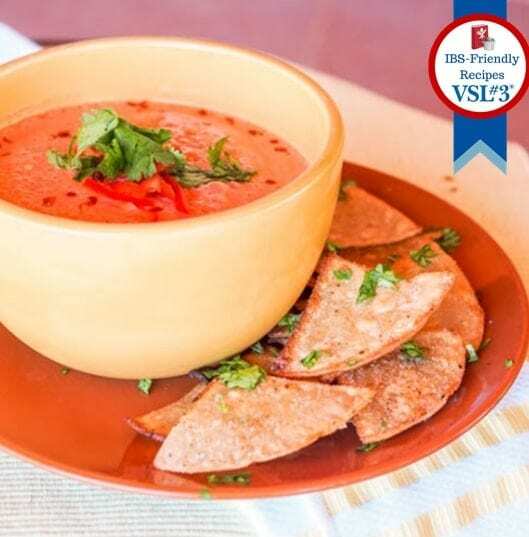 Vicky, I’m loving the vibrant red color of this soup! And the fact that’s it’s no cook. Well done! Haha thanks! No cook soups are definitely a win win! This is so fascinating! I definitely want to try this alternative take on tomato soup! Such a simple quick lunch. Literally ready in minutes! My brother has chrohn’s and I’m going to point him to Vsl#3 on thanksgiving. Fodmap will help him a lot, I think. Yes the FODMAP diet could potentially help him. I hope it does help him!! Mmmm how lovely – no bake and blender. Love an easy, fresh meal! Exactly! Simplicity at its finest!